Sometimes the City gets to me. An off day will strike me when I don't appreciate the thousand shades of gray for being the beautiful display of monochrome gradations that they are. On those particular days, days like today when I feel a little run down and awfully tired, I pick up a bright shining orange or two (or in this case, five). Whether they're moro (blood oranges), cara cara (pink navels), or regular sweet navel oranges, there's something about them that make me smile. 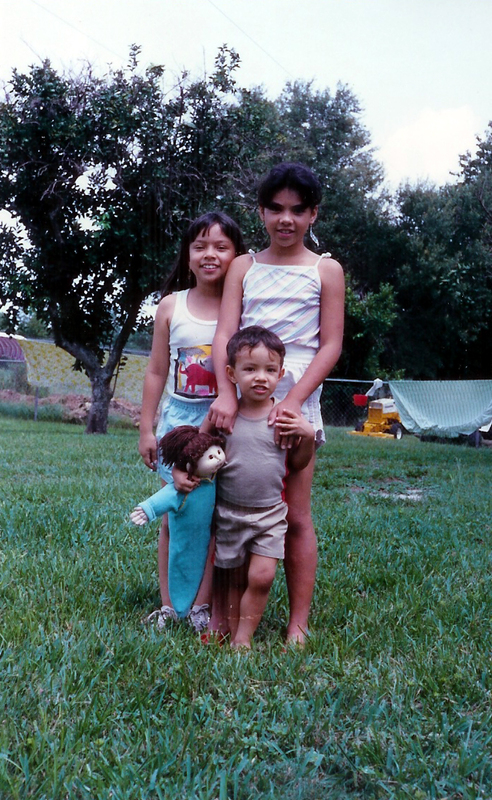 Could it be the sun-drenched Florida memories from my childhood? Is it that their sweet and acidic tang cut through the fog? I don't really know. I just know that they make me feel better about the world. When I had first moved to New York and was having a rough time getting on my feet, I would go grocery shopping for the most perfect orange I could find. 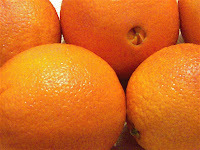 I couldn't afford fancy trips or expensive shopping sprees, but I could get an orange. Simple pleasures sometimes mean the most. Nowadays, most of my meals are quick and grabbed in various states of going to and from work. It's a shame, because I love food and the idea that food is another way of expressing one's self and their affection for their loved ones. So, in an effort to rekindle my proverbial cook's fire, I had William, a friend, her sister Liz, and Liz's boyfriend, Alex, over for a late dinner. Liz and her boyfriend are going to be returning to their respective homes soon and I wanted a chance to hang out with them again before they go back. 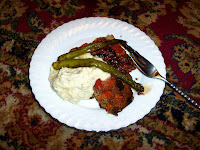 On the menu was a meatloaf (my secret recipe), Gorgonzola mashed potatoes, and butter-roasted asparagus with lemon. I just dropped by the Hellboy movie site and found that they've uploaded the new teaser trailer for the next installment of this fantastical, action-adventure, franchise: Hellboy II: The Golden Army. I love Guillermo del Toro's work and how visual his movies are and how much they are steeped in mythology and folklore. The new movie is apparently filled with fairies, elementals, and a Troll Market. It's due to come out this summer. I can hardly wait! I just came across THIS on a couple of blogs and news sites. 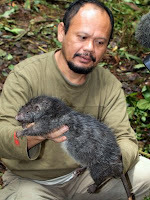 Apparently a "new" species of giant rat was found in Indonesia. I, for one, would have preferred it remain a mystery. I am slightly phobic of rats and knowing that they come in an even larger size is what nightmares are made of. 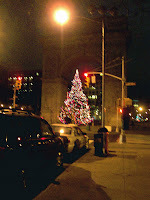 Also, having lived in New York for several years now... I think that I've seen larger "track rabbits" than the critter on the left! I've been very busy lately. When I'm not at work, I try to squeeze as much art and jewelry into my schedule as possible (much of the time at the expense of fresh laundry and household chores). I also have been working on catching up on some holiday gifts that I didn't quite finish yet. We have also begun planning the party in Tucson in February. I'm really excited - things are stewing. 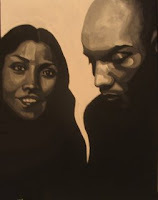 I was over at my sister's blog and saw that her sister-in-law, Jenny Ogden, painted this picture of the two of us for Cynthia's Christmas present. I dug through my archive of photographs and found the photo-booth picture that Jenny's painting is based off of (shown to the left). It is always interesting to see how images are translated into paint and to examine the choices of an artist in creating their piece. I think Jenny captured me perfectly; she even got the bags under my eyes right. By far, my most favorite gifts this Christmas were two mandrake brooches created by Anne Choi. William found out about my obsession with Anne Choi beads and my desire to collect all of the brooches she made inspired by John Donne's, "Song." She hardly ever makes them and I covet them with all of my heart. Apparently after much begging and groveling, he somehow managed by some form of high magic to convince Anne Choi to make these for me! I was surprised and deliriously happy to see these as my present! SURPRISED AND DELIRIOUSLY HAPPY! Anne Choi is AMAZING for making these and William is AMAZING for getting them for me! Now, I must find a way to get my grubby little hands on the others in the series. My friend Tommy graciously opened his home to entertain those who didn't have previous plans for Christmas. 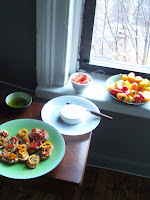 Accomplished in the kitchen, he whipped up several hors d'oeuvres, like sardines and roasted bell peppers or toasted baguette slices with skirt steak dressed with French roasted garlic and spicy mustard. All very yummy! It was a nice way to spend the holiday. This is a quick snap-shot I took on my way to work this morning. I'm not by nature a morning person at all, but I enjoy sunrises and that particular "fresh" feeling that seems to emanate from the daily act of daybreak. For a few moments on a clear, cool, crisp morning, it's almost as if the world has been injected with a cosmic Febreeze or something. It's hard to imagine that there is war, plagues, famine, and death when the rosy-fingered Dawn comes creeping over the horizon-line. The wonderful Jean Yates created this award for me. She said that I deserved an award for being "sweet and thoughtful" as I go about my "busy bee artist day". She named the award after my honey-themed Swarovski crystal piece that was recently accepted as a semi-finalist for the K. Gottfried Inc. Worldwide Design Competition. I think Jean Yates deserves a Miel Award for being so sweet herself! Today it rained. Work is usually slow when it rains. 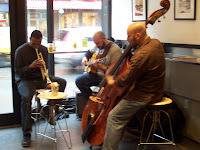 However, the jazz trio came to play. Omar and John (with their rotating third) have been coming by for awhile. They always enliven the atmosphere and transform even the most dreary of days into a bash. 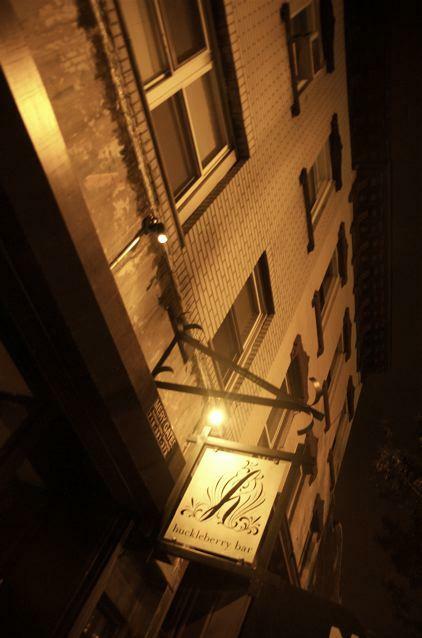 Above: (Left) The line to get in on a Friday night outside of the posh Meatpacking district club, Lotus. 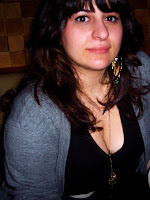 (Right) My friend and fellow artist, Francesca. My friend, Essye Klempner is collaborating with a group of her friends on creating a social club for artists called: CEAS (Creative, Eccentric Artists' Symposium). The goal of the CEAS is to create an environment for artists of various media and types to meet and interact. 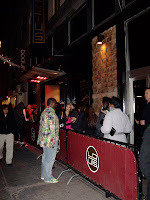 The first event was held at Lotus. With a dropping of a few names, the long line was easily by-passed and entrance to the crowded downstairs was admitted. The music was loud and the crowd, young and hip. I was tired and wore out. So, after a few hellos and a couple of walks around the venue, I called it an early evening. It was good to touch bases with a few friends that I haven't seen in a while. 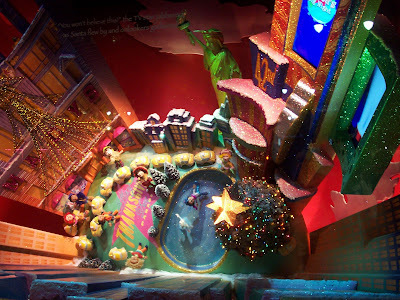 I was so inspired by Jean Yates' posts about her memories visiting New York City and the windows as a child, that I went out after work and snapped a couple of shots of various holiday windows. CLICK HERE to see them all. Even with all of the holiday cheer and happy faces looking into windows, I still haven't been bitten by the holiday bug just yet. Simply put: I'm exhausted. I've been working like crazy. When I'm not working 13 hour days at work, I'm trying to finish up some projects for some magazines and some holiday presents. Let's just say that I'm not getting very much sleep. Anyway, I'm off to finish up some work before bed. 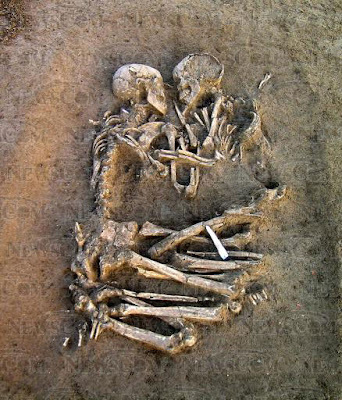 Two Neolithic period skeletons found locked in an embrace in Mantua, Italy. Right now, this image is stuck in my subconscious. Jean Yates sent me THIS link about how Amazon purchased a copy of J.K. Rowling's The Tales of Beedle the Bard. All the proceeds go to charity. It's the book of fairy tales referenced in the last Harry Potter installation. The book is one of only seven copies that was illustrated and written out by the author herself. Although my heart is filled with longing, I like how it is rare and seemingly more magical. I've been thinking about the sensation of touch and the stigmas associated with it in preparation for my pitch for the show. 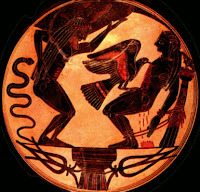 I usually look back over ancient archetypes to look forward. 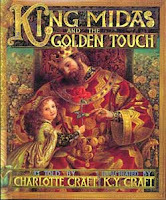 What came to mind was the myth of King Midas and his golden touch. Something that at first seems like a gift, transforms into a curse. I'm going to try and incorporate this somehow. I've been going through some of my old emails and saw this email from Beading Daily. They send out daily projects and ideas for working with beads. This particular one featured THIS DESIGN by my sister Sheila. It's called, Swallow. It spotlights a focal piece by Anne Choi and a bird toggle from my family at Green Girl Studios. I love how there's so many repeating wing shapes. It's almost as if it'll just fly away! Choose from among more than 1,000 original works on paper by hundreds of emerging and acclaimed artists at this signature event to benefit ARTISTS SPACES's dynamic, artists-centered programming! 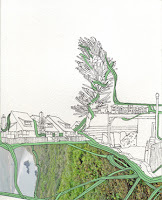 Above Left: Letha Wilson, It Came Through the Trees, 2007, C-print, Xerox transfer and gouache on paper, 7 X 9.5 inches. I've had horrible migraines all weekend. I imagine that trying to juggle everything is finally catching up, either that or I'm not getting my daily caffeine fix. Or perhaps it's the cold or a combination of the above. In any event, much of my rest has been plagued with vivid phantasms of vultures pecking out livers. Thursday night, I went out to New Jersey to attend the 1st Thursday Event at Gallery FoF in Rahway. The show that was opening was called, "For a Good Time Call..." The show was focused around women painters and their various approaches to the media of painting, some delving into classical still-life and others organic abstraction. Rahway has a budding cultural community and I look forward to seeing what other projects will blossom in the Garden State. 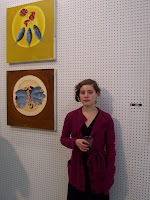 Left: Essye Klempner in front of two of her still-life paintings. In her artist statement, she mentioned that she moved towards still-life painting to truly and genuinely examine a subject on an intimate level. Her sumptuous paintings with surprisingly geometric compositions provide a feast for the eyes. 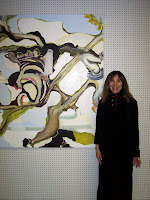 Left: Linda Nicholas posing with one of her paintings. 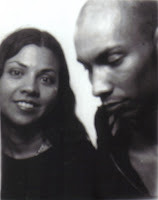 I first met Linda several years ago at a summer residency at the School of Visual Arts. I was happy to see how she translated those small format collages into large scale paintings, bending and twisting the pictoral plane, giving a sense of internal intimacy. 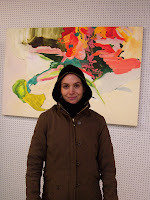 Left: Rachel Frontino, all bundled up and about to leave, in front of one of her paintings on display. As it turns out, her studio is just down the way from my apartment. I will definitely have to stop by to check out her undaunting committment to abstraction in action. After Jenny and I saw The Golden Compass, she let me borrow her copy of Lyra's Oxford, which is also by Philip Pullman. It's a short story with several different intriguing clues to a potentially more involved companion story in his forth-coming collection of short stories, The Book of Dust. I read it on the train out to Jersey, which I will write more about later. Right now my appetite is whetted for more of Lyra's world. This will be a brief post, as there is still much needs be done before I can rest. I've been very busy these past couple of days. I'm going through manager training, which is quite a load unto itself, but I have also been trying to finally organize my studio space and catalogue some of my recent projects. I have a nasty habit of piling things up in stacks. Things get lost in the amidst the strata. I am also trying to figure out ways of making some extra cash for the holidays. I always seem to get sucked into the money-pit this time of year. Anyway, it's back to the grindstone for me! 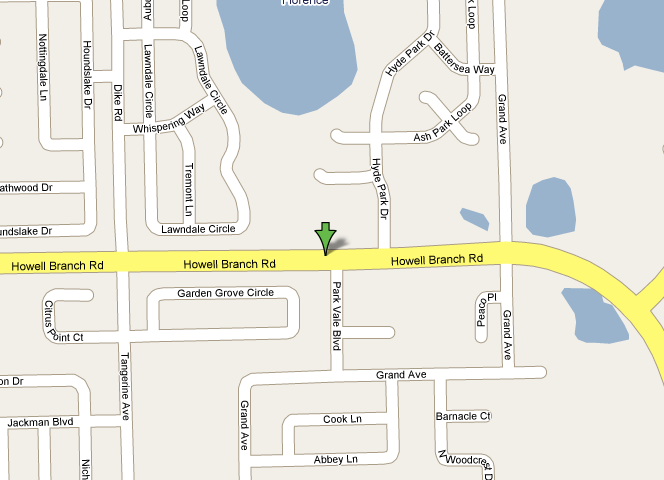 I just found out through my sister's blog that the house I grew up in has since been demolished. What stands there now is a new building. For me, it is strange to accept this. I always knew the day would come that the Old House would have to go. But it was such an integral part of our childhood that I had some how thought we'd be apart of the dismantling of it. 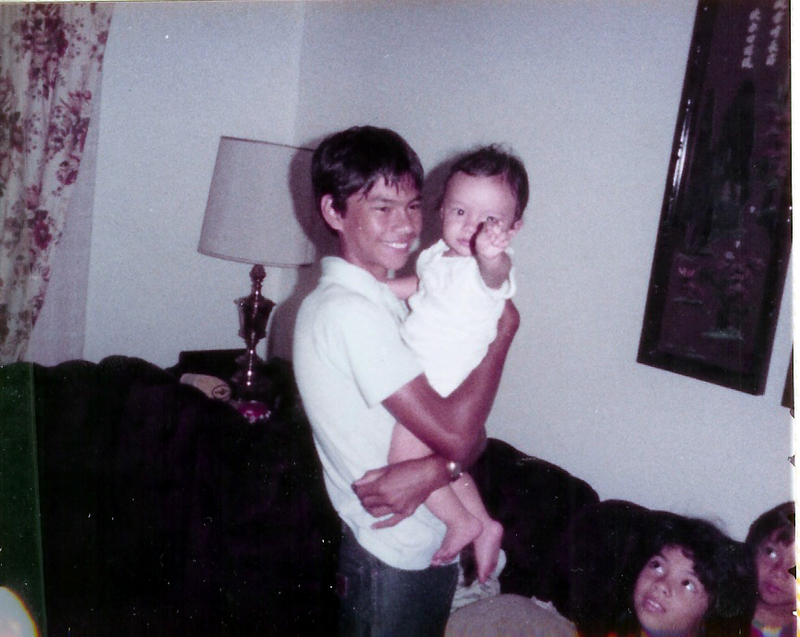 I remember the pride in which my family took in making it more than just an old wood-framed orange grove house and turning it into a home, building it up to be more than what it was. I always had a fantasy that my sisters (and perhaps even my brother) and I would comb the torn down ruins and hunt for treasure. Sheila and I had a particular fantasy that during the Great Depression the wealthy owners of the orange groves thought to hide their vast fortune in an old coffee can beneath our unlikely house. The date of the construction would match and our imaginations were as wild as the flaming trumpet vines that we drank the sweet nectar from. 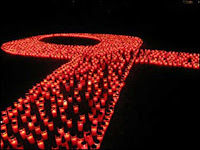 Part of me also recalls that this was the last place that I saw my brother. It was the last place we all saw him. In the ever-changing landscape that is Florida, would he some how navigate back to that Old House? If he were to return, called to the place of his departure, would he go to the site of that Old House and some how be confused? Would he see this new building and give up on the past, give up on us? Somehow that building seemed to be the last solid link to my brother. I know that in this age of digital technology, that it's not necessary to have a standing structure of wood and nail to be found... that maybe even now he is quietly lurking in the shadows and reading these words... maybe. It's funny to think how much I hated living there at the time. It wasn't fancy or new like all the other kids' homes. I remember how we were teased because we hung our clothes out to dry on the clothes line. 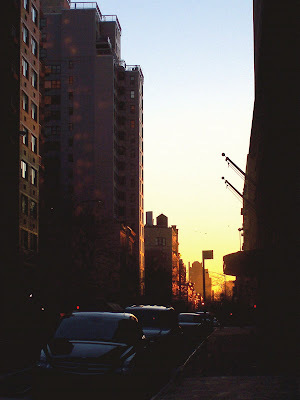 But looking back, I see the simple pleasures of living there. I remember feeling the sun on my skin as I ran through the sweet smelling sheets billowing in the wind, pretending that they were the sails of a pirate ship or a secret labyrinth or some great impassible wall. I remember the notch in the camphor tree where I hid my treasures. I remember swinging on the tire swing on the slow growing oak dripping with Spanish moss in the backyard. I remember. And now, our memories are all we have. 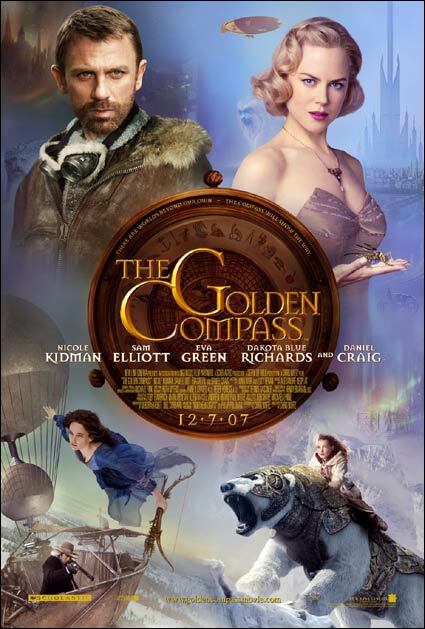 Even though I almost over-dosed on a bottle of DayQuil and nearly died from exposure from standing in line for our seats in the cold, Jenny and I still managed to catch the early screening of The Golden Compass. Thanks to the extremely awesome William, who got us advanced tickets, we were able to see the film almost an entire week before it hits theaters nationwide. And it was worth it. I had to run out from the theater to retch up vile orange putrescence a couple times, but I thought the movie was beautifully adapted and that the film was entertaining and well executed. I can't wait for the sequels. 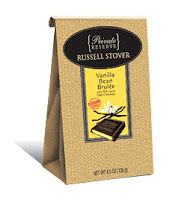 Imagine the intense flavor of Madagascar vanilla wrapped in dark chocolate. Imagine the sweetness melding with the slight bitterness. Imagine it no more with Russell Stover's new Private Reserve chocolate, Vanilla Bean Brulée. Each rich square is delectable. You can't beat the bargain price of $3 a bag either. I love blood oranges. I love sorbet. And now, I love blood orange sorbet. 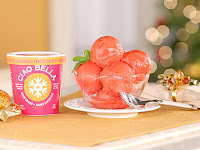 Ciao Bella has just released this celebrity-craved flavor that's made with all natural ingredients. The best thing is my bodega now carries it! Last night, while I was sleeping soundly, it snowed. Part of me was excited by it. Snow has this magical ability to seem to transform even the most trashy of streets into a winter wonderland. I love that the first snow of the year seems like such a joyous and fun occasion. 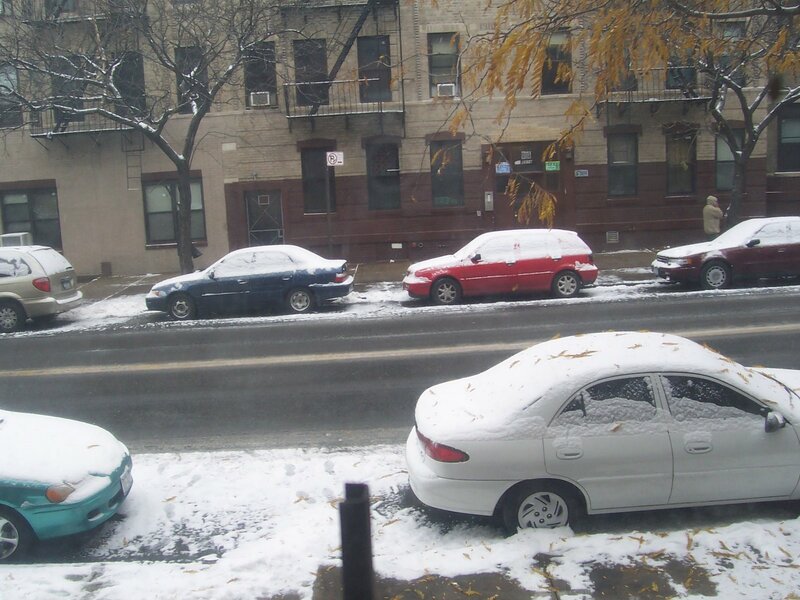 However, the other part of me (probably the part of me that grew up in Florida) abhors the cold and the snow. That part of me was calculating just how much extra time it would take trying to navigate the snowy streets (and in affect how much later this would make me), if it would ruin my shoes, and if I would fall down again (which has become an annual tradition). Earlier, William and I headed over to L'Orange Bleue in SoHo to meet up with Gretta for dinner. She's so fabulous! It was my first time and it was a blast! Bellydancers, an entertaining bartender, and a delicious meal equal a grand time. I totally recommend the "beef cheek". 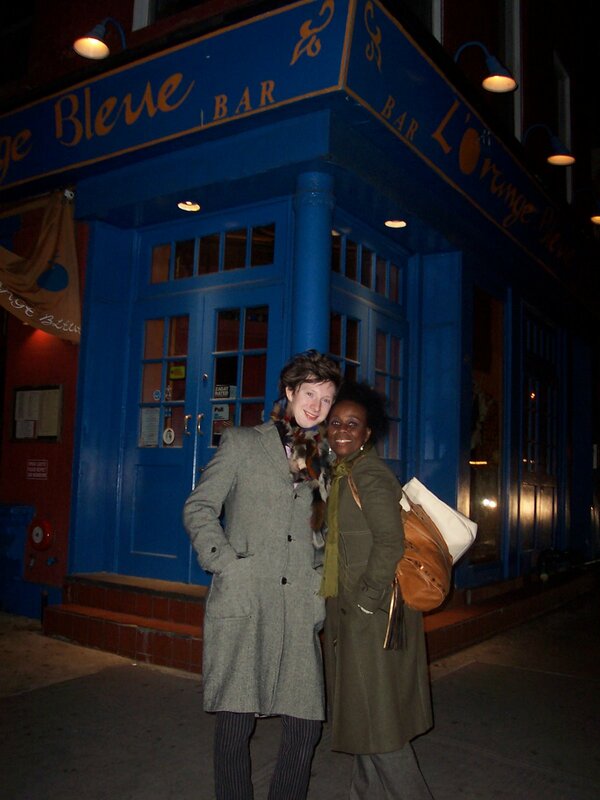 Left: William and Gretta outside L'Orange Bleue on a cold and windy night. Make sure to swing by Huckleberry Bar on Saturday, December 15th (from noon to 4 PM) for their Holiday Trunk Show. 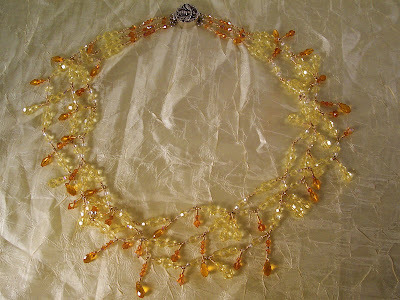 Jewelry and other goods will be offered by local designers and artists, like THIS ONE, or THIS ONE, and even THIS ONE. I'm definitely going to try and swing by to see what the kids in the neighborhood are making. And while you're there, you might as well enjoy a yummy cocktail. Please take a moment to remember and reflect. 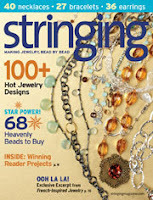 Stringing Magazine is due to hit magazine racks this week; keep an eye out for this really great publication. I love that this is magazine made by designers for designers. It is a venerable fount of inspiration that is brimming with new ideas. I've got a piece in there called, The Alchemist. My source of inspiration for this piece was the book by Paulo Coelho. I was just informed that my piece, "Miel" was nominated as a semi-finalist for the KGI Worldwide Design contest! I'm really happy that this piece got a second chance. It is one of my favorites that I've made so far.